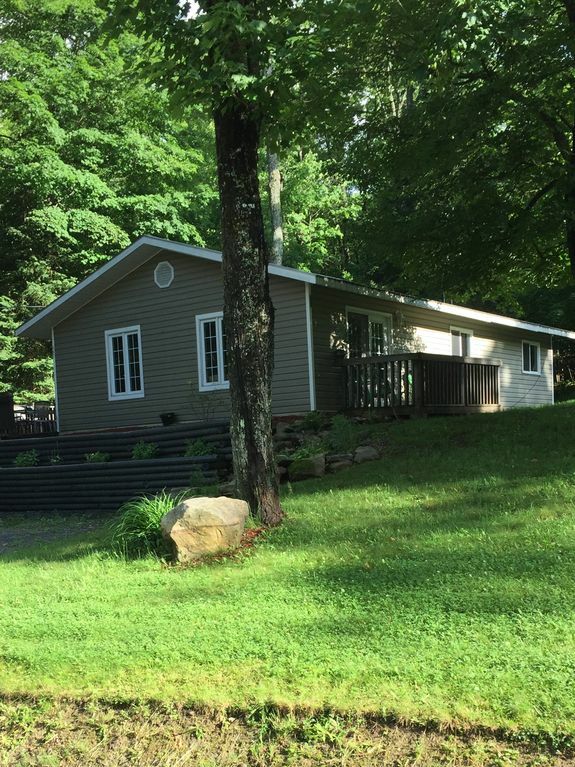 This 3 bedroom, 1 bath pet friendly cottage is perfect for family getaways. It's nestled in Muskoka’s picturesque scenery which provides natural beauty in all 4 seasons. Enjoy the gorgeous view while soaking in the outdoor hot tub. You'll enjoy having Lake Vernon water access across the quiet road with a dock in two different locations, both within a 3-4 minute walk. The house sleeps 8, so your entire family can spend quality time together. The master bedroom has a Queen bed, the 2nd bedroom has a Double bed, and the 3rd bedroom features a set of bunk beds, a day bed, and a trundle bed. Clean bedding, pillows and towels are supplied. There are games and DVDs for a variety of ages and interests. The house is fully equipped with a kitchen that's perfect for cooking family style. There's also a propane furnace and clean drinkable well water. The cottage is secluded enough for true peace and quiet while still being close to shopping and restaurants in Huntsville. Huntsville offers a quaint downtown strip with boutique/unique stores as well as all the major box stores. There are many restaurants, at every price point available to choose from. Located close to Algonquin and Arrowhead Provincial Parks, you can enjoy the ice trail for skating in winter, and great hiking in summer, and go moose watching too! Summer only features: a bunkie with electricity, canoe use and an outdoor bar. There are two decks, one with gas barbecue and table for 6, the other facing the large yard and Bunkie. Thanks for letting us use your cottage. It was nice and cozy and came equipped with everything needed for a comfortable stay. There was lots of sleeping space and a nice area to watch movies and socialize as a family. We were particularly impressed with the strong internet service given the area. A couple things to consider to continue to improve experience: the cottage had a strong dog smell and the stairs were not adequately cleaned of ice and were a little dangerous. Otherwise, we had a fun time around the property in the snow and enjoying the charm of Huntsville during the winter! Lovely cottage, just what was promised! Cottage was charming and exactly as described. Spotless. Perfectly close to trails and wonderful neighbors was a bonus. Quiet and peaceful. Owners were very accessible to answer questions. We thoroughly enjoyed ourselves! We had a great time at the cottage. Hot tub was the highlite for us. We enjoyed the DVD collection. We really didn't want to come back to reality. Definitely will be back! We absolutely loved our stay here! We came in early December and it was a winter wonderland. The temperatures were cold but the hot tub and fireplace kept us warm! The cottage had everything you need and was the perfect weekend escape. Thanks so much again! We are so glad you enjoyed your stay. Hope to see you again! This cabin is a peaceful and cozy getaway. We enjoyed our time there in nature. Our only complaint is that the hot tub was not working. We specifically chose this cabin for our getaway to celebrate our anniversary because of the hot tub. It was #1 on our 'must have' list when selecting a rental. We were extremely disappointed to discover it was not working upon arrival and we immediately informed the owner. They were unable to have it fixed before we left. Other than that, this is a great place for a relaxing getaway to unwind. Lots of board games and DVDs were available and reliable, high speed internet was appreciated. I totally understand the hot tub was a big disappointment for you guys... but its working now... I'm glad you enjoyed everything else, in spite of that disappointment. We would highly recommend this cottage!! We have never seen a cottage so fully stocked, kitchen has everything we could think of, lots of towels, even an adaptor to mirror your phone to the TV! We totally over packed. Clothes and food is all you need. Sleeps 12 which is amazing!! Lots of movies and games there for the kiddies. Beautiful outside bar, large fire pit, hot tub. Barbara and Tom are wonderful and always just a text away. Be mindful of a steep walk going to water for anyone with trouble walking but once there a beautiful view where you can swim, fish or canoe. I can’t say enough good things about this place!!! We loved it!!! !